Jacklina Jekova is a designer based in Sofia, Bulgaria. 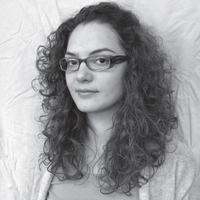 She completed her BA at the National Academy of Art in Sofia, Design in Advertising department. Then she focused on hand lettering and type design and she completed her MA at National Academy of Art, Calligraphy department. After her graduation she started working as a type designer at Fontfabric Type Foundry. Her first product was Madelyn, a display handwritten script font based on the expression of real handwriting. She was also invited to PhD in the Calligraphy department of the National Academy of Art. Now she starts her first year in researching different experimental calligraphy techniques comparing with classic fonts. She gives calligraphy lectures presenting different tools and experimental techniques to the students. She was part of the team of Fontfabric Workshops and shared her knowledge of making script and calligraphy letters.